The process of investigation is dynamic and fluid. The approach must be reasonable and the investigator flexible. However, in order to be successful, every investigation must have a meaningful purpose and be executed ethically and lawfully. Inevitably, employers must invest time, money, and patience to ensure they obtain demonstrable and actionable results. To achieve this and reduce the exposure to unnecessary business disruptions and litigation, every workplace investigation must by driven by process. 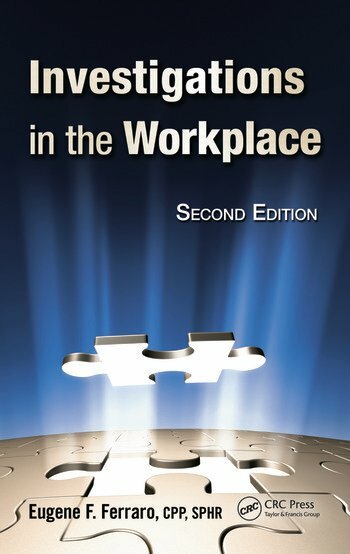 Investigations in the Workplace, Second Edition provides both novice and experienced investigators with the most insightful and useful information available on the methods and processes for the proper and safe investigation of workplace crime and misconduct. Gleaned from Eugene Ferraro’s nearly three decades of experience, the book is designed for easy reading and use—dispelling common myths and presenting new approaches, methods, and strategies. Revised and updated with more methods, techniques, and case studies, this powerful book also includes new diagrams, checklists, and visuals to help readers put the material in context and make their investigations soar. Each chapter begins with Key Learning Points and is supplemented with boxed Tips, Traps, and Common Mistakes. An exhaustive appendix includes a glossary of common investigative terms, sample surveillance and investigative reports, advice on digital evidence, and more. Investigations in the Workplace, Second Edition is a must-read for corporate investigators and security professionals, human resources and law enforcement personnel, attorneys, and anyone else tasked with conducting or supervising workplace investigations. Learn to conduct fast, efficient investigations and obtain the highest possible return on investment from every investigation. Eugene Ferraro has been a corporate investigator for over 29 years. Specializing in the investigation of employee dishonesty, substance abuse, and criminal activity in the workplace, he has conducted thousands of investigations for employers throughout the United States and internationally. He is also a published author and speaks frequently on the topics of workplace investigations and crime in the workplace. Mr. Ferraro is board certified in security management (CPP designation) by ASIS International, has served as the chairman of its Workplace Substance Abuse Council, and is currently a member of the Standards and Guidelines Commission. He is also the program advisor for the ASIS International Professional Certified Investigator Review Course. He is a member of the Association of Certified Fraud Examiners and is a certified fraud examiner (CFE), a professional certified investigator (PCI designation), and board certified in human resource management (SPHR designation). "The book is extremely well written, thoughtfully organized, and replete with pertinent examples … an important read for security professionals at any level, including students in criminology, corporate security practitioners, human resources employees, attorneys, and law enforcement. 5 out of 5 stars."